Eggless is another one of Adelaide’s awesome dessert cafes (Canberra, please take note), and they shake things up with a new menu every month! I can’t even imagine the creativity that the team has to keep this happening year after year. 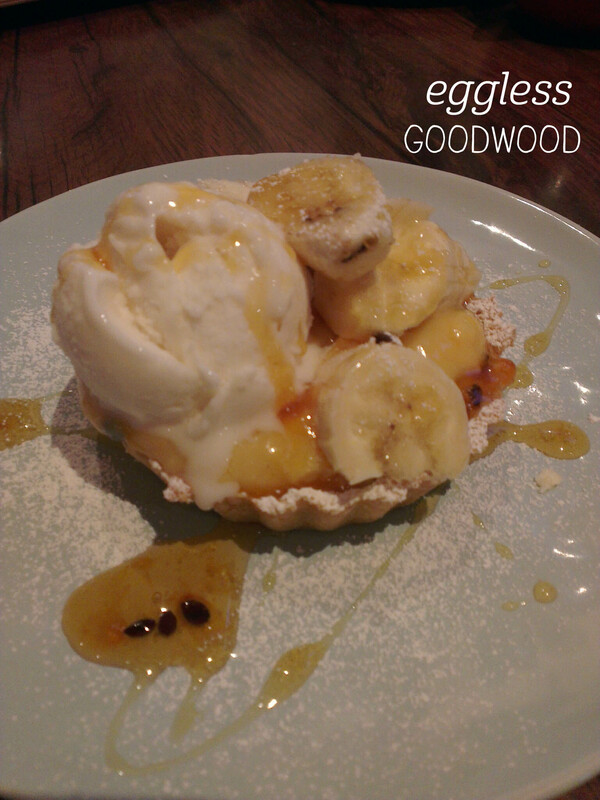 So I dived right in and picked one of the January specials – the Banana, Passionfruit and Anzac Tart ($12). The tart was beautifully presented, with fresh banana piled on top, abig scoop of soy icecream (yes, that’s right, this dessert is vegan so lactose free! ), drizzles of passionfruit syrup and a healthy dusting of icing sugar over the lot. Mmm. The tart shell was made of anzac biscuit-flavoured pastry, with that lovely sweetness of golden syrup and oats, and the luscious passionfruit curd inside the shell was blissfully good. The flavours all worked so well together, and of course the textures were balanced too – dense, not-too-crumbly pastry plus creamy curd and soft banana. My friends waxed lyrical about the Mango Float, and the Rose Sago looked beautiful too. The service here was fabulous, with friendly staff and table service. I’d recommend arriving early – by 9pm people were putting their names down on the door! You guys, can you believe #icecreamthurs only has a few more weeks to go? We’ve managed to pretend it isn’t winter for so long! 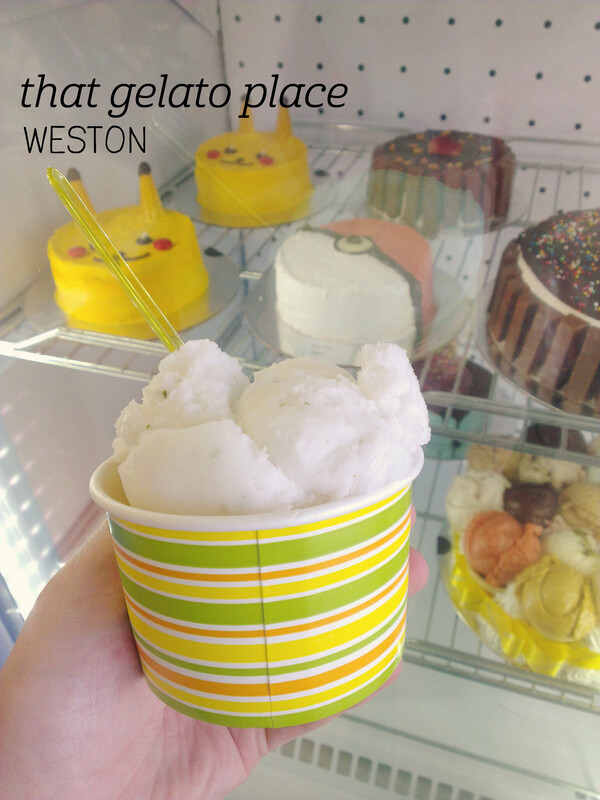 Summer is just around the corner, and what better way to prepare than to indulge in some incredible sorbet from That Gelato Place? The range of flavours here is always impressive, but I was particularly excited to discover their more exotic Mojito flavour on this visit. I paired it with Mango (approx $6.50 for two scoops, can’t remember exactly, sorry!) and away we went. The Mojito flavour is the perfect combination of sweet sorbet and mint – it is refreshment in a cup, minus the alcohol, of course. I could definitely see myself sitting on the balcony with a tub of this in summer. The Mango was equally delicious – rich, sweet and creamy, the ripe fruit was conjured in my head as I took each mouthful. Together, these tropical flavours transported me to a balmy beach somewhere. Sigh. The serve was massive too – scooped up high and in a really large cup, it took me ages to eat the whole thing. That Gelato Place never lets me down! Castillo Forestal is a sight to behold in the early morning – approaching from one side, you can admire the impressive turret that gives it its castle status; approaching the other side, the sunlight glimmers through the modern floor-to-ceiling glass window panes. 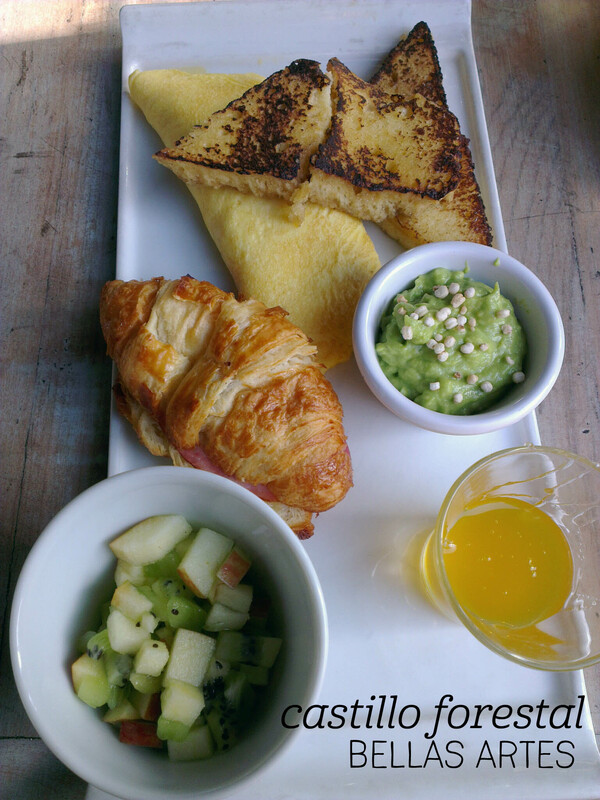 For my first breakfast in Chile, I ordered the Brunch (only available on weekends), which included tea, orange juice, an omelette, a ham and cheese croissant, a fruit salad, bread of the day with honey, and fresh avocado ($9900 CLP). It was certainly an impressive spread. I started with the croissant, which was served hot and had a lovely, rich bechamel sauce inside; the pastry was lovely and flaky too. The omelette was next – fluffy and creamy, it met all expectations coming from a French-style restaurant, and went surprisingly well with the avocado. The fruit salad was a mix of apple, kiwi fruit and banana, which perfectly cut through the rich food. I needed that, because the bread seemed to be some kind of very sweet French toast, and with the honey on top it was even sweeter (good for conquering jetlag). I struggled to finish this – so much food and all of it incredibly tasty. Highly recommended! I haven’t been to Loading Zone in ages, and now that the weather is warming up, Bec and I organised our latest catch up there. I was impressed by the new (but probably not that new) pergola-like shelter, which will make it a much nicer venue in the colder months. 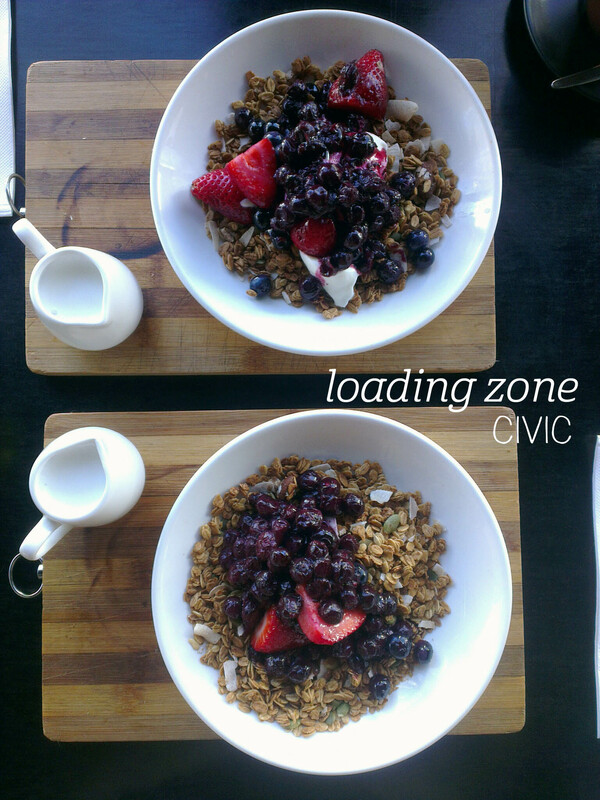 We both decided on the same meal – the roasted fig granola with poached berries and macadamia labneh ($14), although I ordered mine dairy-free. I was a bit disappointed that there was no fresh juice on offer (bottled only), but in such a small kitchen it’s understandable. The granola bowl was presented on a cute board with hot milk in a small jug on the side. I was impressed by the generous portion of blueberries scattered on top – they wer plump and juicy, so much so that my granola didn’t feel dry at all, even without milk and labneh. There were a few halved strawberries, and it would have been nice for a few more. To be honest, I couldn’t really tell that there was fig in the granola, but it was certainly a good one, with a crisp, golden mix including almonds, pepitas, and macadamias. I would still rate the Sweet Bones mix as my favourite, but was very happy with my choice and would happily eat it again. I have raved about Tiffany’s creations before, but she really outdid herself on this one. I’d seen the Mandarin Picked from the Tree ($16) on Instagram, and was so excited to order it on my next visit to Lotus. 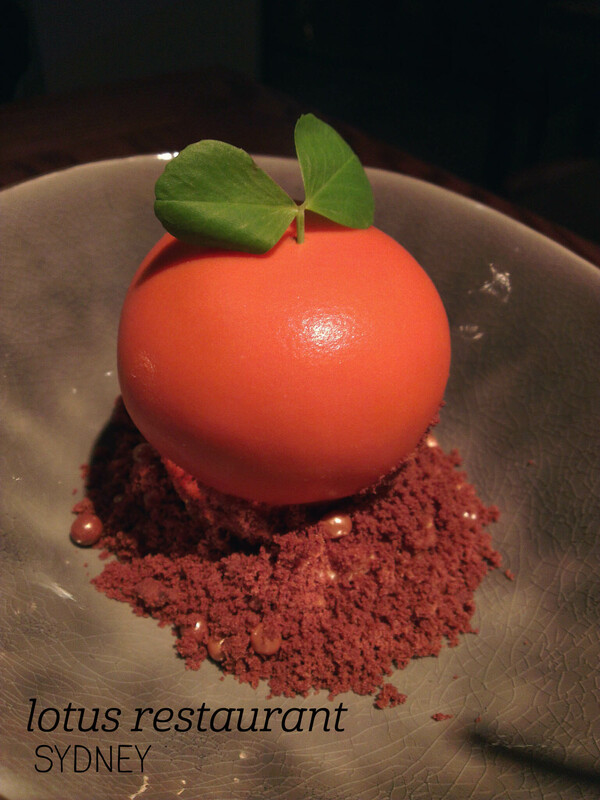 Mum and I marvelled at the beauty of this dessert as it came to the table – the outer coating really does resemble the skin of a mandarin, but cutting it open, we discovered a thin chocolate shell, and, according to the menu ‘mandarin creme chiboust, liquid gel centre, mandarin sponge’. Oh my. Everything tasted so authentically like mandarin, bringing a fresh, slightly bitter citrus tang to each mouthful, matched nicely with the sweetness of the chocolate shell. The contrasting textures were delightful, from the light sponge to the smooth gel. Surrounding this incredible combination of mandarin-things was chocolate soil, caramel pearls and caramel icecream hidden underneath, all of which balanced the citrus tang and added just the right amount of sweetness. I loved everything about this dessert, and hope that it stays on the menu for a long time to come. I’ll share photos of the inside on my Instagram account later today, if you’re curious. 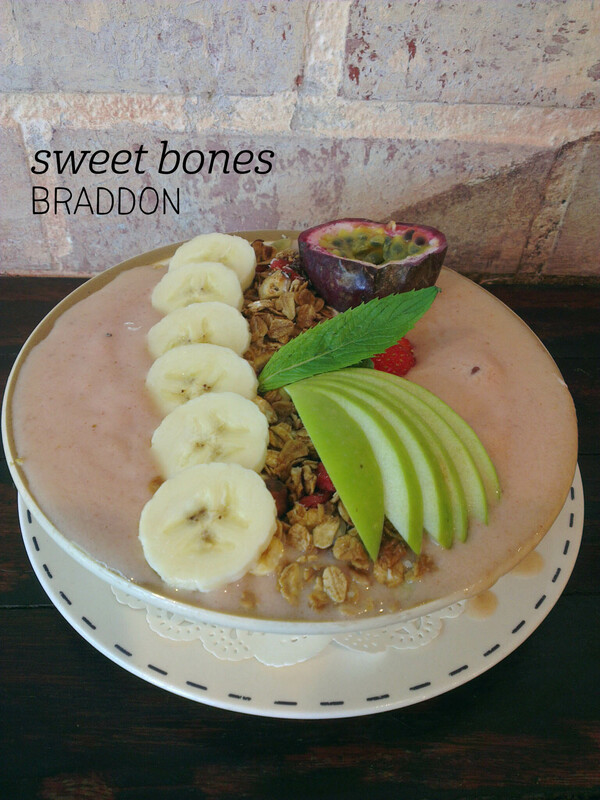 What do you do at Sweet Bones when you want both granola and a smoothie? You combine them into a smoothie bowl and have both, yay! I adore Sweet Bones’ dairy-free menu, so I picked my smoothie, the Fit Sistas Smoothie with strawberries, banana, apple juice and flax oil, and added Eileen’s granola and seasonal fruit to my order to make the smoothie bowl ($16). The granola here is unbelievably good – jam-packed full of dried fruit – apricots, cranberries and sultanas – plus more nuts than you can poke a stick at (almonds, hazelnuts, macadamias) AND sunflower seeds… Oh, and did I mention that it’s all toasted in maple syrup? Swoon. The granola was still crunchy was despite floating in smoothie, and I actually enjoyed the combination with the smoothie far more than I do granola with milk. The smoothie had great texture – not too icy, and with a nicely balances sweetness – and there was sooooo much of it! The fruit on top (oh, hello banana, Granny Smith apple, strawberry and passionfruit!) added a great splash of flavour and a mix of textures, creating a filling, wholesome breakfast that I can’t wait to order again. 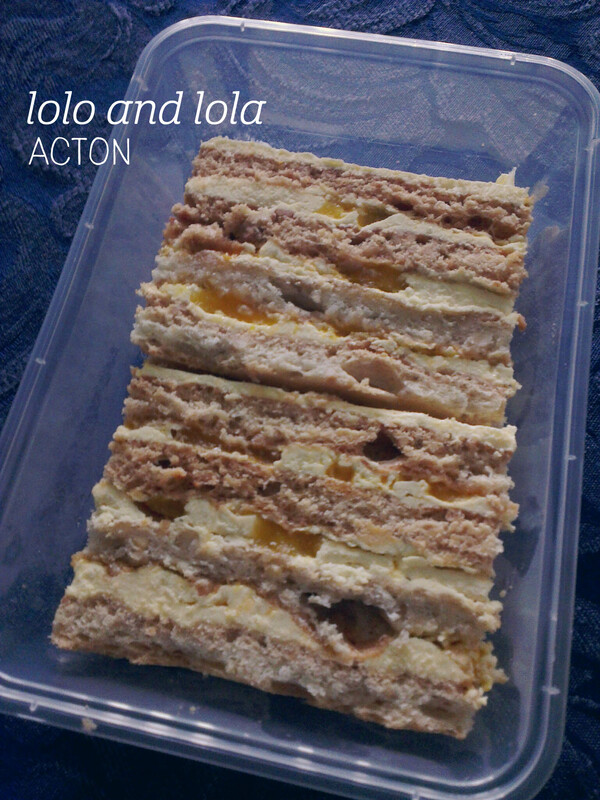 I am a hopeless sweet tooth, and having heard so much about the cakes at Lolo and Lola, I had to try one. I went for the mango sans rival (mango without rival, $7), which is something I’ve never tried before. The cake portion comes with two slices, and it becomes clear quickly that this is a particularly amazing cake. Layered with buttercream, meringue and chopped cashews, the combination of crunchy, soft and creamy textures is amazing, creating a real adventure in sensations. The flavour of the buttercream is almost savoury, so that the sweetness of the meringue, flavoured by the cashews, complements rather than clashes. I found that I enjoyed the layers of meringue that were slightly firmer, with an almost crunchy outside (swoon). In between these layers are soft drizzles of mango, which add a beautiful flavour that stops the whole thing from being sickly but add a luscious, fruity richness. I devoured this dessert, and think the double-serve makes it great value too. Given that the menu changes daily, I can’t wait to go back and try more of their cake range. I think it’s love.